“You never know when a miracle will happen.” The Honorable Patrick Carroll, Lakewood Municipal Judge, stated this optimistic phrase several times in reference to the eternal hope that any heroin addict can overcome this seemingly insurmountable disease. 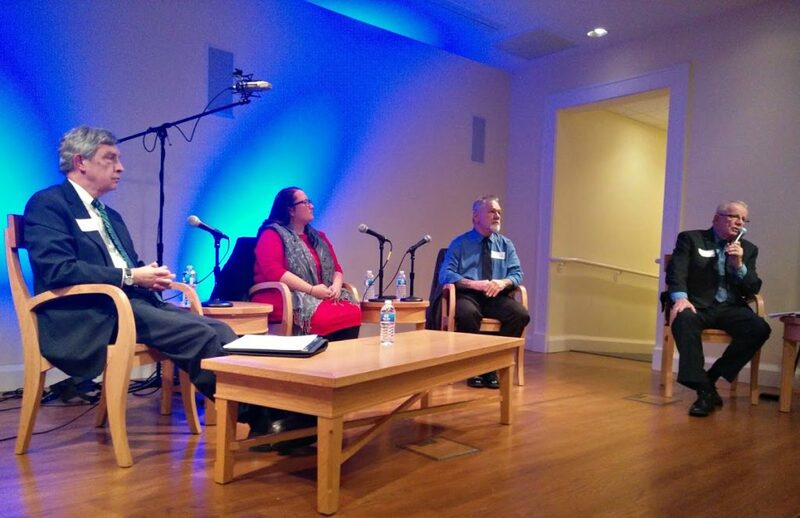 (Left to Right): Panelists Judge Patrick Carroll, Erin Helms and Tony Parker, and Moderator William Denihan. Hope served as an overarching theme Thursday evening, Nov. 10, when 90 attendees gathered at Lakewood Public Library for a community forum entitled “The Heroin Epidemic: Understanding Impact and Options.” Presented by LakewoodAlive, this public forum sought to discuss how our collective efforts can make a significant impact on the lives of those impacted by the devastating effects of heroin use. Moderator William Denihan, CEO for the Alcohol, Drug Addiction & Mental Health Services Board of Cuyahoga County, led a thoughtful discussion that included both panelist insight and questions submitted by members of the audience. When Denihan asked how many people in attendance know someone who has lost a loved one due to heroin abuse, nearly every hand in the room went up. In addition to Judge Carroll, Erin Helms – Executive Director of the Woodrow Project – and Tony Parker – Executive Director of The Lantern Center for Recovery – served as panelists. Both reflected on their own battles with addiction, and how overcoming this disease has effected positive change in their lives. Heroin represents the most commonly-abused drug associated with overdose deaths in Cuyahoga County, according to the Cuyahoga County Medical Examiner’s Office. It’s estimated that approximately 500 Cuyahoga County residents will die from heroin overdose during 2016. 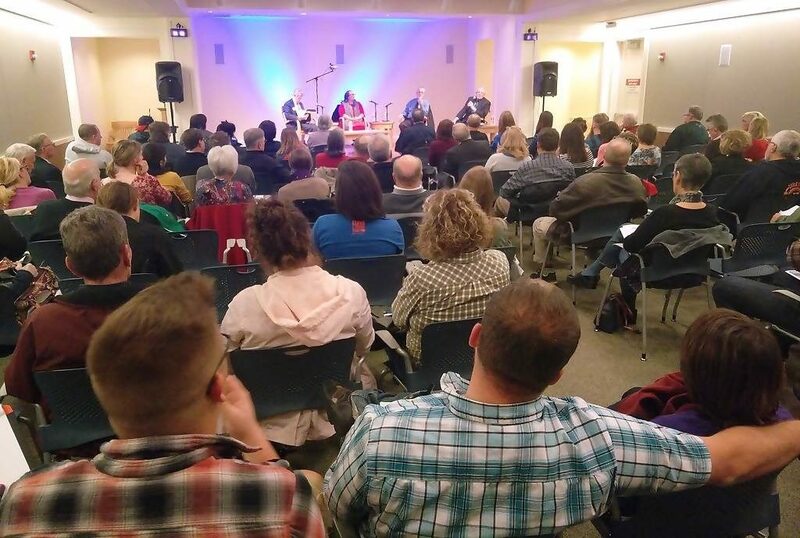 There was a packed house at Lakewood Public Library on Thursday evening. Ultimately, the panelists agreed early education, effective treatment and society’s ability to erase stigmas associated with heroin abuse each represent key components to better controlling this epidemic. The large audience for Thursday’s community forum ranged from city leaders to healthcare industry professionals to recovered addicts. People from all walks of life, it seems, have a vested interest in defeating the heroin epidemic that plagues not only Cuyahoga County, but much of our nation. LakewoodAlive thanks the following volunteers for spearheading the planning process for this community forum: Cindy Einhouse, Cindy Friedmann, Katie Kurtz, Sean McDermott, Rachel Novak and Mark Thomas. A special thanks also goes to Lakewood Public Library for hosting the forum. LakewoodAlive hosts community forums pertaining to topics relevant to Lakewood citizens. For more information, please visit lakewoodalive.org or contact Ian Andrews, Executive Director of LakewoodAlive, at 216-521-0655 or iandrews@lakewoodalive.org.